Hi alla mama's genea-blogger friends! 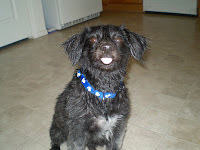 I'm Izzie, mama's loveable dog. I decided to hijack her jeanie alogy blog for the day so I can see what she spends so much time on when she's ignoring me. Mama told me that she uses this box to find her ants estors, whatever that means. She says it means she’s trying to find out the people from whom she de-sends. I usually don’t much care what others do, so much as it doesn’t affect me. But I just had to give this jeanie alogee thing a try. So here’s my first attempt at tracing my pack. 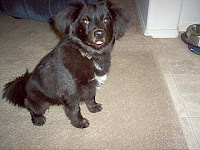 Mama was told that I am a Pomeranian and Cocker Spaniel mix. Let’s take a look at that. First let’s take a look at the Pomeranian, since mama says it’s easy to see the Pom in me, with my curly tail and incredibly springy feet. My eyes, too, but definitely not the ears. According to Dog Breed Info (www.dogbreedinfo.com), this part of me originated in the Prussian region of Pomerania (gee, what a concept…Pomeranians hailed from Pomerania). There was a dog breed there known as the Spitz, and apparently the Pomeranian de-sended from that that breed. Now just how they make one "pure-bred" dog from another I will never understand, but I digress. Did you know that Marie Antoinette and Mozart once owned Poms? So did Queen Victoria! 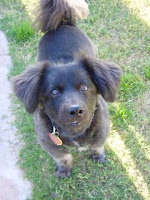 Dog Breed Info also says that Pomeranians are smart and would make good circus animals. Hmmph. You never hear humans say “oh he’s a smart guy, he’d be great as a circus performer”. Now, on to the Cocker Spaniel. Mama says it’s hard for her to see the Cocker in me; sometimes she’s not so sure. 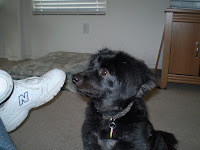 But a few times as we were leaving Petsmart (mama loves that store; I hate it, though I do like trying to creep under the racks of dog food for kibble) she’s heard people comment without talking to mama “Look a Cocker Spaniel mix”. Hmmm. Let’s investigate. thumbnails/american_cocker_spaniel368x_1190665991490.jpg here. Mama can see a little similarity in the fur on the legs. Do you? 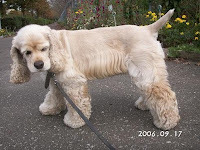 Here’s a little bit about the American Cocker Spaniel. Dog Breed Info says these dogs de-send from the English Cocker Spaniel, which I’ll talk about next. Both Cockers were once used to flush out woodcock birds, which is how they got their names. Mama says that may be why I can creep along on my tummy with my legs off to the side as I move towards kibble under the food racks at Petsmart. One of these days she’ll get a picture of me doing that. She says it’s funny. Now mama can see some similarities when she looks at a picture of the English Cocker. She says the fur on my back grows in a similar pattern. While my head is thinner, the flatness along the nose line and forehead is somewhat similar. Also the lines along the rear upper leg and the hips are similar to the English Cocker, though you can't see it in this picture of me. 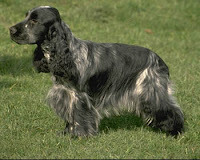 The descriptions of both Cockers identify this breed as fun, loving, and great with kids. Well, I’m okay with kids now, but I used to be terrified of them. But I don’t play with them, or anyone else, really. I sometimes play fetch with mama, but not for long and only when *I* want to. Mama says that’s because the Pomeranian in me shows the stubborn streak, and, moreover, she says I wasn’t socialized well when I was a puppy. I was reportedly kept in a crate most of the time and never learned to play or not be afraid of others until I was taken out of that place. Well, that’s my surmised story, and I’m sticking to it. I know I’ll probably never know who my true ants-estors are, but perhaps I’ve reconciled my packs. What do you think? Do you see Pomeranian and Cocker Spaniel in me? Mama says she could make The Genetic Genealogist proud by mentioning that there are Doggie DNA tests that can determine the breeds of mixed dogs, but mama says it really makes no difference. She loves me just the way I am. 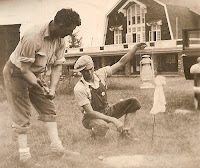 Maureen Taylor of The Photo Detective had a post a little while back "Pictures of the Old Homestead: Nothing New". She inspired a re-post of this photograph, passed on to me by my cousin Mike. 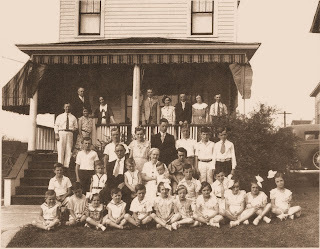 This picture shows the members of the DOYLE and TIGHE clans in front of, I believe, the Leo DOYLE home on Union Street in Pittston, Luzerne County, PA. I think I've also mentioned before that the boy standing up on the 3rd row from the bottom, left side (wearing short sleaved white t-shirt) was the grandson of my great-grandfather John J. DOYLE (1876-1944). The boy shown here was also named John J. DOYLE and he is the one responsible for my getting into genealogy. I'd found a white grave marker engraved with his name, rank/serial number, place and date of death in a group of photographs I was scanning and re-organizing. I started to search Google for the information on the marker to figure out who this person was, since I knew it couldn't have been my great-grandfather. The rest is, well, history. The 3rd Edition of Smile For The Camera takes its word prompts from a celebration of home. Where is home and how do you celebrate? Choose a photograph of an ancestor, relative, yourself, or an orphan photograph that shows a celebration of home. This is what I will always remember as my true home. This is the house I grew up in on Garlow Road in Niagara Falls NY. 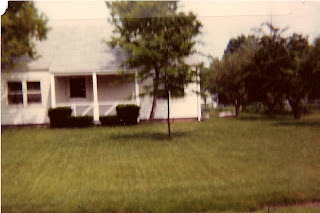 When I lived there, there was a huge tree limb that reached across the front window from the tree to the left (top of it is barely visible in this picture from about 1980). Not only was this a great house to live in, the house was in a great neighborhood called Colonial Village. 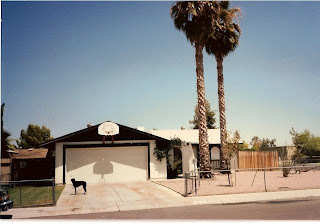 Everyone knew everyone, and everyone's children played in every other family's yard (except for Yarnell's yard; when going from one house to another next to theirs, we had to cut to the street, walk past that house, then cut back up in the yards again). 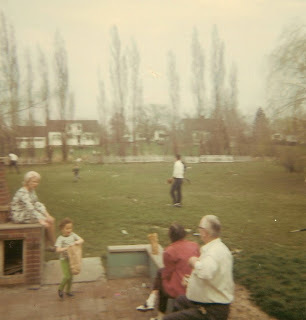 Speaking of yards, this was our back yard, which played host to cousins and grandparents and aunts and uncles as well as neighbors and friends. Notice something? NO FENCE. Well, when you see the fence on the next house, the white picket one here doesn't really count. This house survived numerous pick up football games, a miniature (a REALLY miniature) hockey rink, a sewage leak in the middle of the back yard, a huge crack in the basement caused by the rock quarry down the street, and most of all, it survived .............well......... ME. I haven't lived in this house for over 30 years, and haven't seen it in real life for over 20 years, but the thought of it will always bring back the very best memories of my childhood. When I was 13, my family decided to leave Niagara Falls NY (from where hell freezes over in the winter) to Tempe, Az (to where it's hotter than hell in the summer). The biggest problem with this house? Well, my brothers would say it was the fact that it only had three bedrooms (which meant they had to share one, since I am the only girl!). But I say it was the fence. Sure, it was functional, and it kept the dogs contained (Mandy here was a great one, but never fear-she was only out front when we were right there to watch her). But it didn't foster much in terms of offering warmth to the neighbors. I noticed a few unique differences between the two important cities of my life: In one (NF), we ran FOR cover when it rained. In the other (Az) we ran FROM cover into the rain. In one, we ran FOR cover in the summer heat (Az), while in the other we ran FROM the cover in the summer warmth. One house was the center of generational activity and the other was the center of one generation coming of age. Two houses, two different meanings. They both add up to a single, loving home. The 51st edition of the Carnival of Genealogy is posted now by this month's host, Thomas MacEntee of Destination Austin Family. The topic was Independent Spirits, and there are lots of good reads linked in Thomas' article. Thanks for putting it together, Thomas. I myself have been rather absent from blogging lately, and I am much chagrinned about it. I won't even make excuses about it, either, because who ever believes excuses? Suffice it to say, I'm BACK! I have returned to scanning the pictures from what I am calling the Bell Book: A very old photo album with a velvety cover and hard pages with pictures cemented to them. A little while ago I discovered that my scanner's lid comes off, and this is allowing me to scan these photos without tearing the pages out of the book. The first group of photos are below. As I looked at these photos, I couldn't help but wonder if perhaps they were taken on a trip in celebration of something, perhaps even Independence Day. Though there are only guys here, so it was probably a boys weekend out or something. After I scanned these photos at 200 dpi using the .jpg format, I remembered a tip I'd read about scanning at least at 300 dpi resolution in .tif format, so I scanned the others using those settings. For some reason, though, blogger won't upload the .tif images, though their help section says that format is accepted. I then tried to upload the pictures to my account at imagecave, but .tif pictures are not supported there. So I couldn't post those pictures. Which is a bummer, since they are pretty cool pictures! Also as I was scanning these photos some other thoughts occurred to me. First, because these photos are cemented forever to the hard-back pages of the album, I'm having to scan entire pages, then crop individual photos from the page. I'm using the software that came with my all-in-one unit, an HP 1500. The software is called HP Image Zone. I can do some very basic editing with this once the picture is scanned. I basically only use the crop and rotate features of the editing program. It's kind of a pain, though, as when I go to save the photos, the default setting is to save them to a folder created by the software ("My Scans") and I have to scroll to the folder I want them in. It will not let me change this default. It gets rather tedious to do this after each photo is ready for saving. I don't save them to the default and then move them all at once because my stupid computer (using Windows XP) has a tendency to make copies of any file I attempt to move or delete, therefore defeating the purpose of saving space. So as I was scanning today I thought, I wonder if I can scan from my photo editing program, which will allow me to change the default folder in which to save them? So I opened up my obscure Microsoft Picture It! 2003 to try this out. Yes, it lets me scan the photos from my scanner, then offers me all the editing choices of the program that I use anyway. The only problem is, once I crop one picture from the page, the page I scanned disappears and is replaced by the one image I cropped from it. Which brings me back to this: I'm really wanting to do some serious photo work on my computer. So much so that I'm thinking about asking my niece to ship me out the photo albums I "restored" for her years ago that got me into genealogy so I can re-scan all those photos again, using better settings than the default. This would be one heckuvan undertaking, to rescan all the photos I have. So I am left with decisions. First, do I go through all that trouble? Second, if I do, and I'm leaning towards it, I will need a better photo editing program. Third, if I really want to do a good job and make the most of the program, I need to learn how to use it in the least frustrating manner possible. So do I get a program that requires a class to take along with it to figure it out? And do those classes exist where I live? Lots of questions. Would love some advice!